Hot off the press (or in this case, the editing room), another fun stamping class that's FREE! In our newest online class, Punched Metal Jewelry, Aisha Formanski shares her signature technique - using basic design stamps to create repetitive geographic patterns. Aren't they beautiful? Watch as she inspires you to use your stamps in a whole new way to create patterns that really pop. In just 24 minutes, you will expand your stamping knowledge using a few simple design stamps and graph paper. 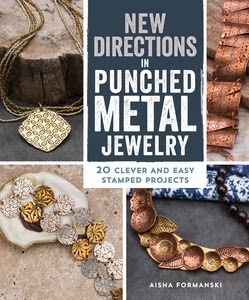 This class is an excellent companion to Aisha's book, New Directions in Punched Metal Jewelry. In the book, she features 20 gorgeous designs and even includes eight patterns for you to follow until you're ready to create your own. Best of all, Aisha focuses on inexpensive metals such as copper, brass, and nickel to create these designs. Beautiful jewelry does not have to be expensive!